The beauty of this recipe is that you can change the flavor just by changing out one ingredient! Today I used Blackberry Ginger Balsamic Vinegar, but I have also made it with Champagne vinegar, Cinnamon Pear vinegar, etc… This chicken is always plump, juicy and delectable. Whisk together all the ingredients except the chicken. Remove 1 half cup of marinade and reserve for basting chicken while it grills. Place chicken in an airtight container and cover with marinade. I use a Tupperware marinade that can be turned over ever little while. Marinade at least 4 hours, but I prefer overnight. Preheat grill to medium and lightly oil your grates. remove chicken from marinade, letting excess drip off. Grill chicken 6 minutes per side or until cooked all through. 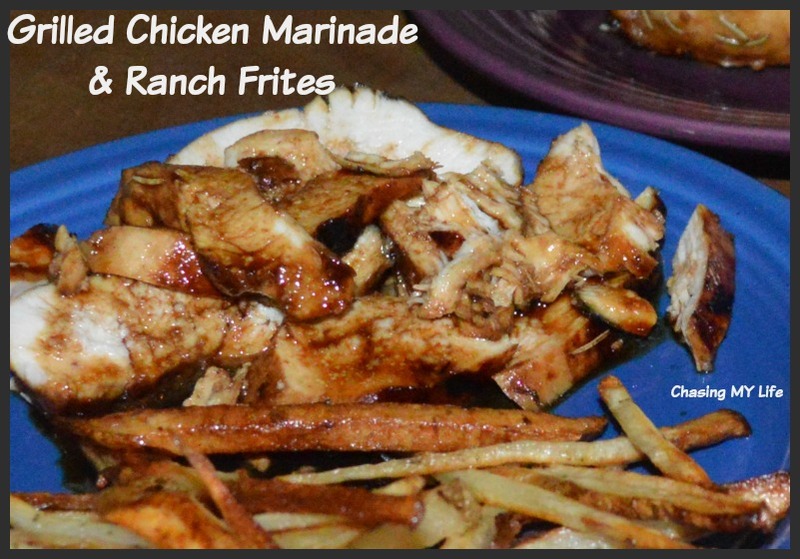 Baste chicken with reserve marinade while grilling. Let chicken rest under foil tent for 5-10 minutes before serving. While chicken is resting, bring reserve marinade to boil and simmer until thickened for a sauce. *NOTE: If you prefer you can use olive oil. I just don’t like it.